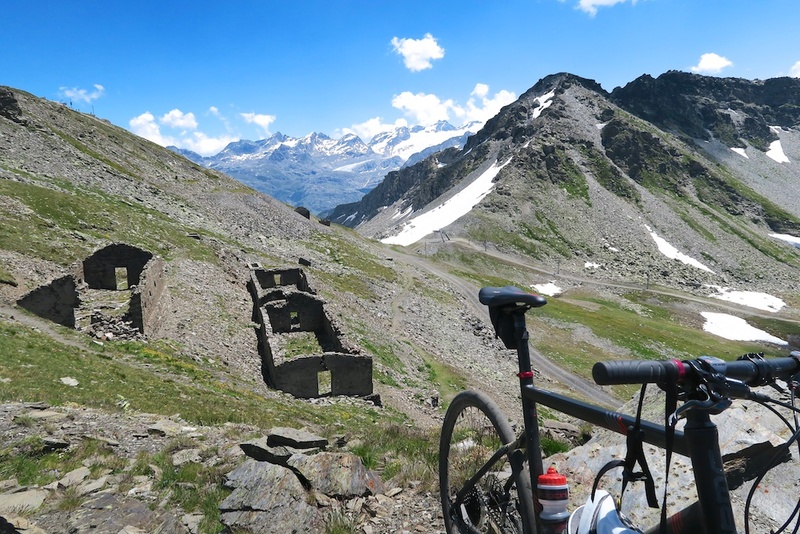 I am going to split this ride into two blog posts as it features two very different climbs (and I took a lot of photos). This post deals with the messy loop in bottom part of map. 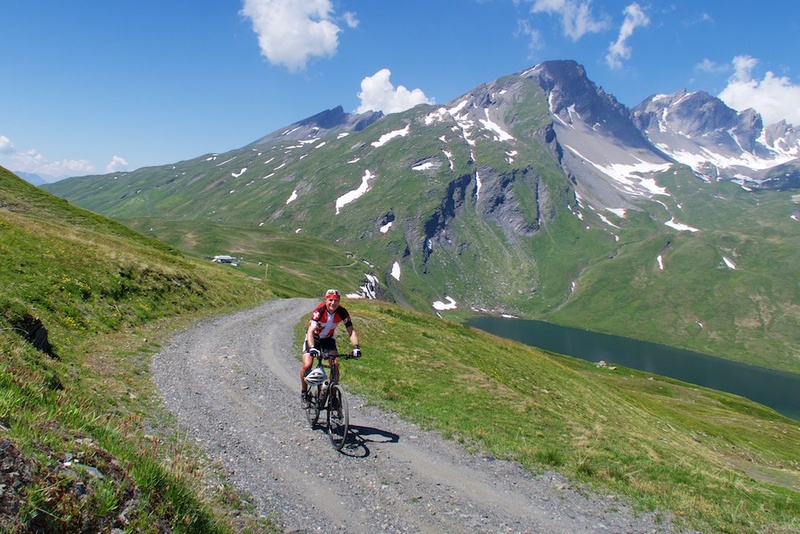 To goal was to explore some unpaved roads above Col du Petit St. Bernard/Colle del Piccolo San Bernardo (2188 metres) – the route goes far higher. 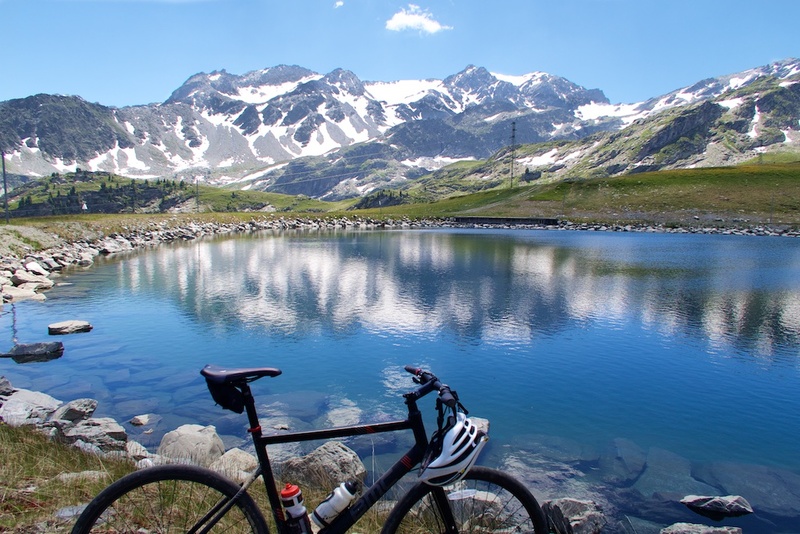 I started in La Thuile, Italy, skipping the lower part of the climb to Petit St. Bernard avoiding the tunnels. 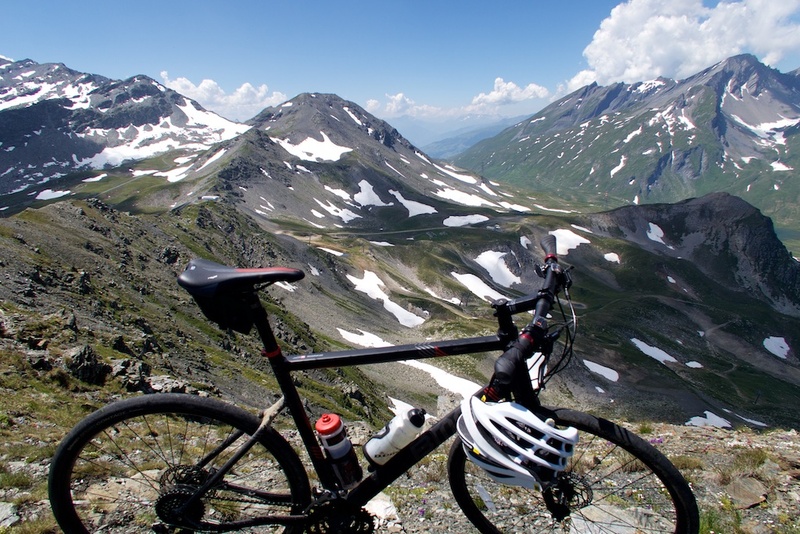 If you road-bike up the Italian side of Piccolo San Bernardo, I highly recommend climbing via Colle San Carlo. Much harder/quieter, it descends into La Thuile skipping the busier, tunnel-filled main road. Details here. 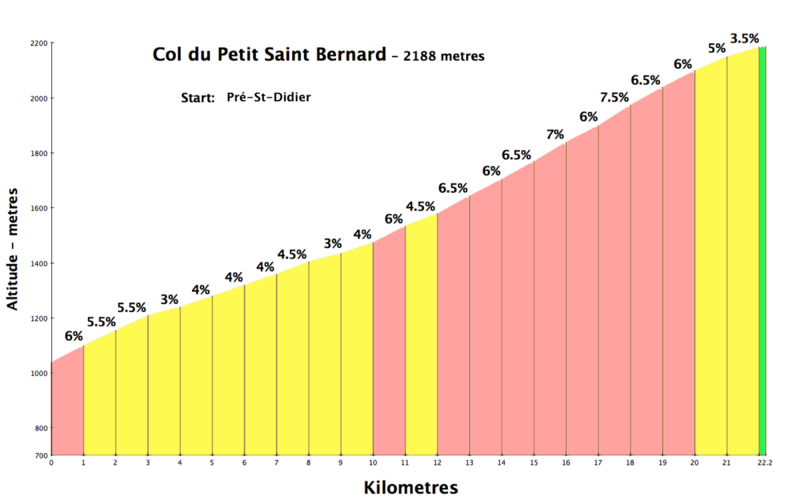 The profile at left is only for the paved road to the Col su Petit-St-Bernard. It’s a nicer climb than I remembered – much of it recently resurfaced. I passed three roadies on my cross bike and one of them couldn’t resist chasing me down. 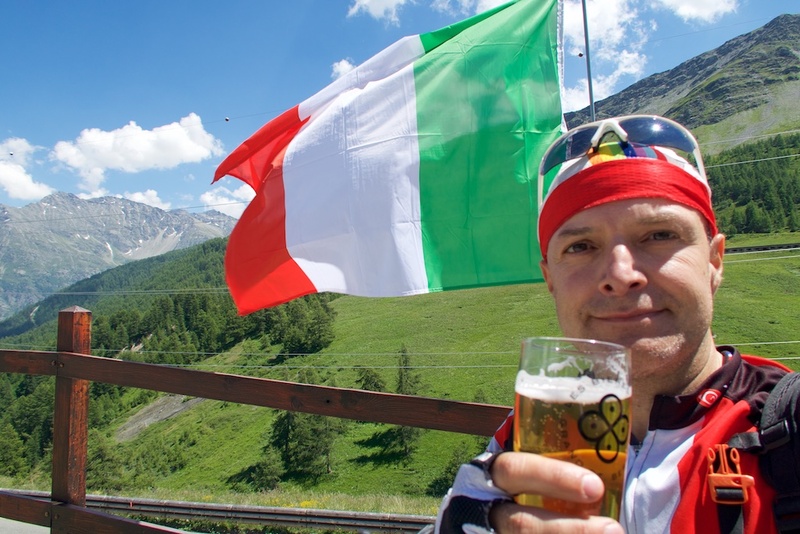 A friendly Brit, we enjoyed chatting and he gleefully out-sprinted me to the Pass (2188 metres) at the Italian/French border. But for me this was where the fun started. On the Italian side of the Col, I took an unpaved ski station service road heading higher through the deserted ski slopes. Early slopes. 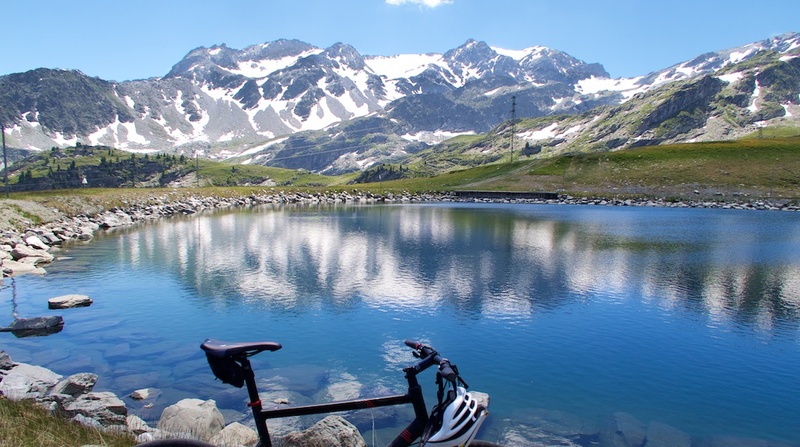 Lake is beside/below Col du Petit St.Bernard. From Fourclaz there was a steep road higher to a little peak with another chair lift. 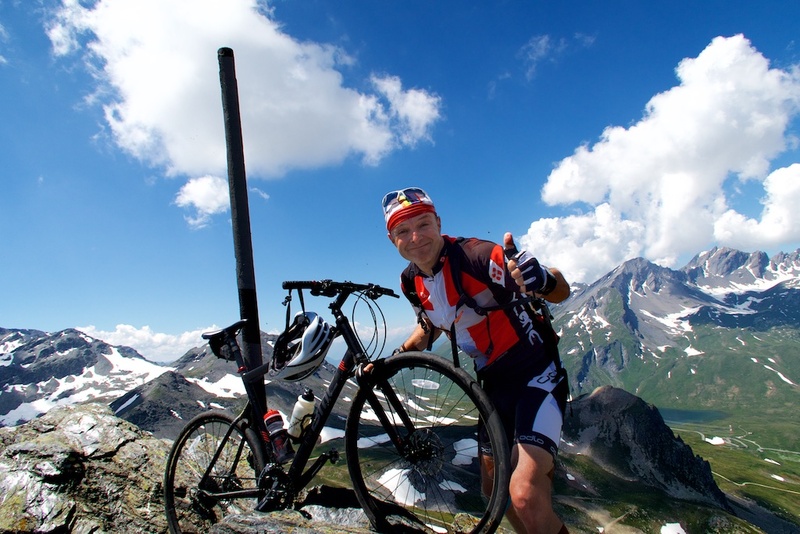 This was Chaz Dura at 2581 metres. The next goal Mont Belvedere in middle distance – Col Belvedere high above my saddle. 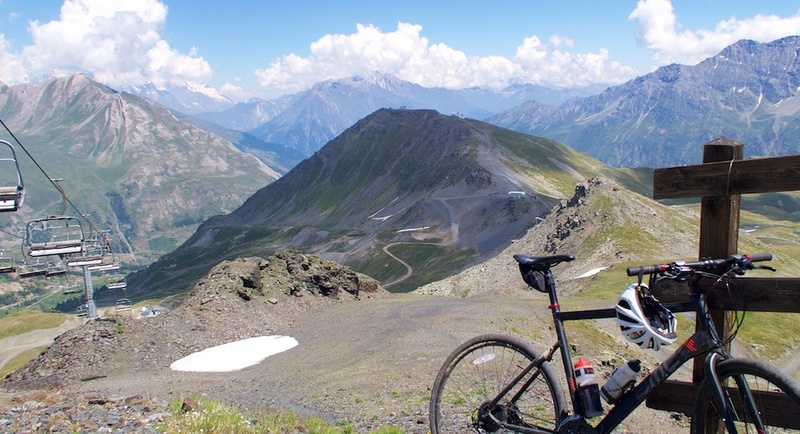 This outcrop is a dead-end, so I descended and followed a road in the opposite direction to Mont Belvédère – first passing over Colle Belvedere (Col du Belvédère) at 2569 metres. From the Col I proceeded higher to another chairlift summit atop Mont Belvedere. 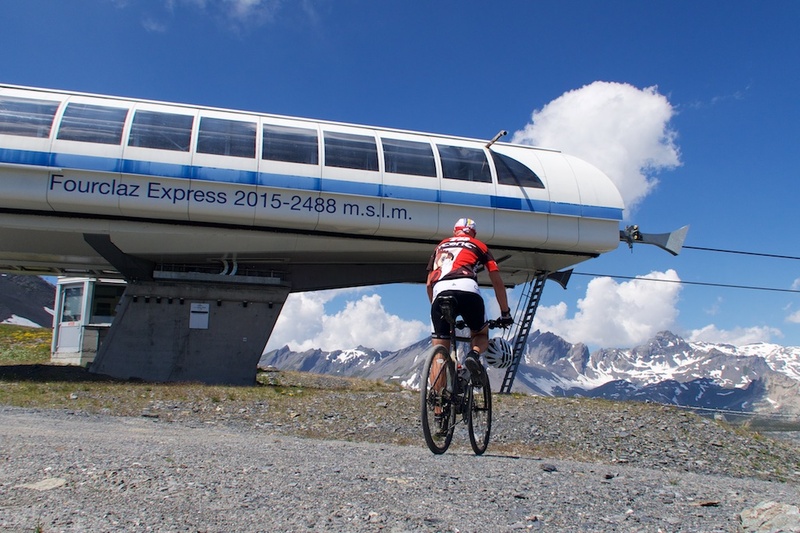 The Sign said 2613 metres. Here is a view of Chaz Dura and if you look carefully you can see the chairlift at top of Col Fourclaz. I had climbed to Fourclaz on those hairpins at left. 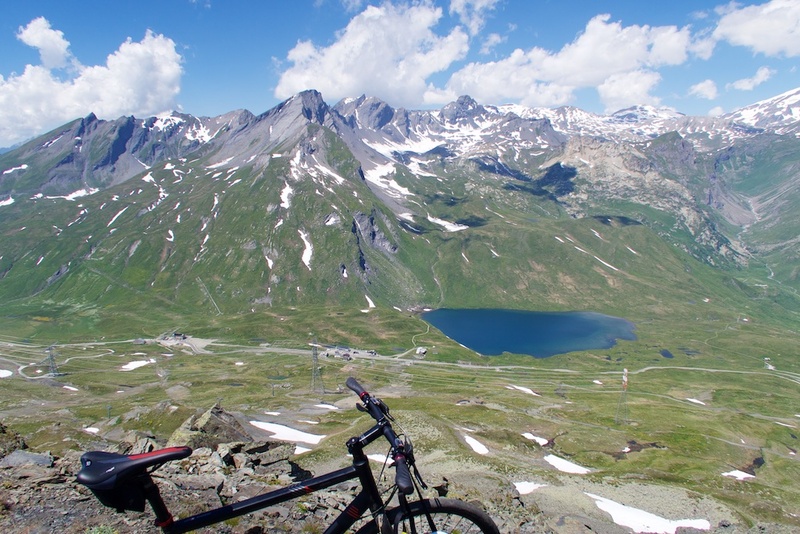 I’d future plans for the far side, and instead wanted to try and return towards La Thuile without using the main road – via ski slopes/surface roads. So I returned to Fourclaz and began down the far side. The descent headed through the centre of the ski area – a few winter chalet/restaurants, etc. 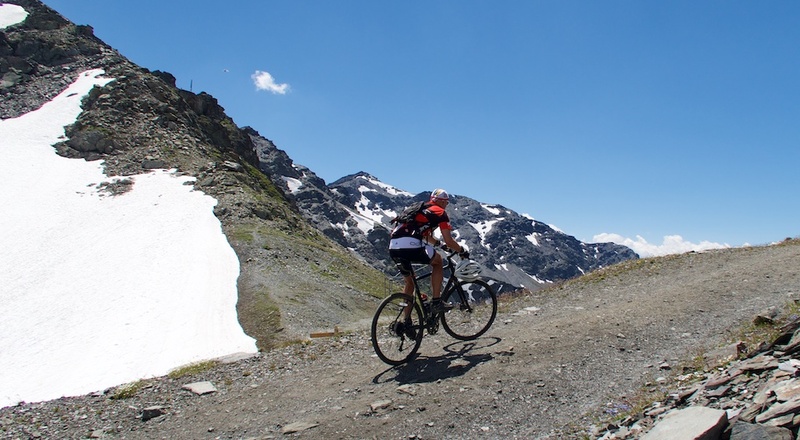 At roughly 2000 metres I found a badly paved road that quickened my descent. Rejoining the main road between La Thuile and Petit St. Bernard I was parched but satisfied, so I stopped at a roadside restaurant for a beverage. The peace and quiet of empty, super-high roads with killer views makes for a perfect day on the bike.